Marion True has presented her side of the recent saga of returning antiquities in an extended interview with Hugh Eakin ("Treasure Hunt: The Downfall of the Getty Curator Marion True", New Yorker, December 17, 2007). True became curator of antiquities at the J. Paul Getty Museum in 1986. In 1995, True had persuaded the Getty to adopt ethical standards requiring objects proposed for acquisition to have been documented and written about by scholars. The implication is clear. True acted with integrity. And this was a point stressed by Malcolm Bell III in his opinion piece, "The Getty's Italian Job", in The New York Times, November 28, 2005. Mr. Ferri's outrage at the looting of Italy's heritage is justified. By laying bare the archives and warehouses of major dealers, he has revealed corruption at the core of the market. But in prosecuting Marion True, he has used decades-old evidence against a curator who brought needed reform to the Getty Museum, and I can only hope the Italian courts recognize the good she has done. But what Bell did not know back in 2005 was the case that was developing for the return of antiquities acquired under True's curatorship. a. Objects formerly owned by Barbara and Lawrence Fleischman and acquired in 1996.
b. Attic black-figured zone cup attributed to the manner of the Lysippides painter. Ex Getty 87.AE.22. Purchased from Fritz Bürki & Son, Switzerland. c. Fragments of the Douris phiale (first fragments acquired in 1981 as a gift from Werner Nussberger). Ex Getty 88.AE.30 (purchased from Galerie Nefer); also anonymous loan L.92.AE.88.2-3. d. Attic red-figured calyx-krater, attributed to the the Copenhagen / Aegisthus painters. Ex Getty 88.AE.66. Surfaced in Basel, Münzen und Medaillen; Freiburg, Morat-Institut; purchased from Christoph Leon. e. Attic red-figured calyx-krater, Syriskos. Ex Getty 92.AE.6 (Robin Symes ; Fleischman collection) and 96.AE.335 (New York, Acanthus Gallery). f. Apulian red-figured pelike, attributed to the Darius painter. Ex Getty 87.AE.23. Purchased from Fritz Bürki & Son, Switzerland. g. Apulian pelike, attributed to near the group of Ruvo 423. Ex Getty 86.AE.611. Purchased from Fritz Bürki & Son, Switzerland. h. Marble statue of Aphrodite. Ex Getty 88.AA.76. Purchased form Robin Symes. i. Marble kore. Ex Getty 93.AA.24. Purchased from Robin Symes. j. Grave stele of Athanias. Ex Getty 93.AA.47. Purchased from Safani Gallery. k. Gold funerary wreath. Ex Getty 93.AM.30. Purchased from Christoph Leon. By the time I met Larry Fleischman, he had a big collection, and many things he bought from Symes ... And I bought from Symes. This [Fleischman] acquisition is in line with exactly what we said we would do ... We went out of our way to be clear that we were not saying we would not buy any more unprovenanced material. The Getty's new position as announced in 1995 is thus not quite the radical change of policy which it seemed at first to many observers. Indeed one of the observers who has supported the Getty position is John H. Merryman who cited the museum's revised policy as an example of the way for a museum to adopt "elaborate due-diligence procedures" (see "Due-diligence procedures are not enough to satisfy them"). How misguided he was. The revised policy was fatally flawed and has led to the return of antiquities to both Greece and Italy. Eakin could have explored issues such as these as part of a more penetrating interview. But he chose not to do so. 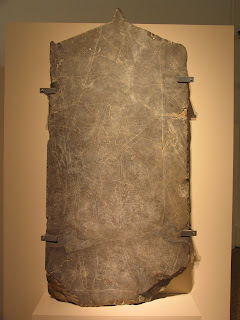 The Athanias stele on display in the National Archaeological Museum, Athens. © David Gill.